To inform the future of humanitarian action, the UN Secretary General convened the World Humanitarian Summit on 23 and 24 May 2016 in Istanbul, Turkey. In attendance at the summit were representatives of 173 UN member states, heads of states and governments, private sector, NGOs, and civil society organizations representatives. Istanbul, Turkey: To inform the future of humanitarian action, the UN Secretary General convened the World Humanitarian Summit on 23 and 24 May 2016 in Istanbul, Turkey. In attendance at the summit were representatives of 173 UN member states, heads of states and governments, private sector, NGOs, and civil society organizations representatives. As an international UN Volunteer working with the Gender Unit in the United Nation Mission in South Sudan (UNMISS), attending the summit was an immense opportunity. I was able to attend various sessions and events, participate in, and interact with different delegates from various countries on humanitarian issues of concern. Such participations and interactions proved fruitful for my work in UNMISS. Through the various issues discussed, I was able to acquire a deeper understanding of humanitarian concerns in different contexts globally. 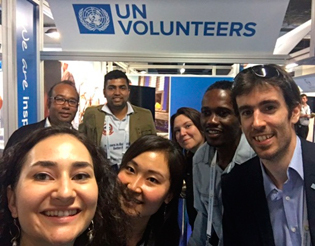 Furthermore, I had the opportunity to interact with, and address different delegates who visited the United Nations Volunteers (UNV) programme’s booth, and was able to respond to queries on questions raised about UNV. I found the interactions at the UNV booth tremendously rewarding. Many delegates visited the booth because of respect for volunteers who commit themselves to humanitarian work. The delegates expressed appreciation to the volunteers in service, emphasizing the critical roles that volunteers play as first responders in emergencies and crises. “Volunteers as first responders”, the side event organized during the summit by UNV and the International Federation of Red Cross and Red Crescent Societies (IFRC), provided a good insight into the various activities volunteers engage in as first responders in times of emergencies. During the panel discussion, Richard Dictus, UNV Executive Coordinator, emphasized the need for greater recognition of the critical roles that volunteers play in saving lives in the first hours and days after a crisis. He called for the need to invest more in volunteer protection, mobilization, management and training with a long-term approach, in an effort to provide sustainable solutions to humanitarian challenges. My interaction with the various delegates, the team from UNV headquarters, fellow UN Volunteers from Nepal, two experienced and dedicated national UN Volunteers serving in Turkey, and also the opportunity to outline the importance and rewards associated with volunteerism were all rewarding and educating. As I reflect on my journey and the experience of my visit to Turkey, I realize that I have gained a deeper insight and therefore more meaning towards my work as a UN Volunteer. Interacting with various people on humanitarian issues at the global level, as well as on the details and benefits of volunteerism towards humanity was more fulfilling than anticipated. This trip served as a starting point for other UN Volunteers to attend conferences, summits and meetings where they can benefit from shared learning, and upon return to respective duty stations, to share different experiences and lessons learned with colleagues. Bio: Sheriff Abdulai (Liberia) studied Sociology and Law, with a Master's degree in Gender Peace and Security. Before joining the UN Mission in South Sudan, he worked as Gender and Justice Programme Officer at UN Women. He also worked as Area Coordinator/Programme Manager at Concern Worldwide, and as Gender-Based Violence Programme Manager at Child Fund.